Arnold Kling's askblog and Roger Farmer have a little exchange on GDP and unit roots. My two cents here. Arnold asks "In stock market returns, econometricians have been able to identify long-term mean reversion even though the short run is a random walk. Can something similar be done with GDP data?" Answer: Yes, and Permanent and Transitory Components is it. Both Arnold and Roger claim that unemployment has a unit root. Guys, you must be kidding. Actually, this makes a great test case for my point in "A critique", that it is a bad idea it is to blindly run unit root tests and then impose that structure. Yes, unemployment like other stationary ratios in macro (consumption/GDP, hours/day, etc.) have important and frequently overlooked low-frequency movements. But they are far from random walks, and they like unemployment have a very large transitory component at business cycle frequencies. When unemployment is above 8%, it is a good bet that it will decline over the next 5 years. If you apply unit root tests to an hour of second by second temperature data from 9 to 10 AM you will think it has both a linear trend and a unit root. Millisecond data will not help you to detect climate change. That's why unit root tests are a problem. You have to think, and consider the span of data you have and the frequency of mean reversion that makes economic sense in your data. The tests are about infinite horizon behavior which you can never tell with finite horizons. However, they can alert you to low-frequency movement in your data, which can make ordinary distribution theory a bad guide. So can looking at a plot. As far as I can tell, "Potential GDP" is equivalent to a two sided filter. It looks great ex-post. None of this is inconsistent with Arnold's view that standard calculations of potential GDP gaps do little to forecast GDP growth, especially in real time. I don't understand your point about unemployment. You're saying unemployment does not look like it has a unit root. But, by the same argument, the detrended GDP probably looks like it does not have a unit root. "Treating macro time series as cointegrated with one common trend is a better idea". I agree completely. To the extent that we disagree, I suspect it is how to interpret the persistent component in GDP (and the persistent component in unemployment). Can a bounded series be described by a random walk. Of course not. But the logarithm of a logistic transform of a bounded variable can be. That is the variable I use in my papers on the connection between the stock market an unemployment here and here. Hi Roger. We're converging. Yes, there is an interesting low frequency component in unemployment, that might be modeled well in a short sample with a random walk (unit root = random walk plus stationary component). And unit root asymptotics might be a better approximation to finite sample distributions, plus warn of of biases like the AR(1) coefficient. But even in logs, let's not take it too seriously. A random walk eventually exceeds any bound. 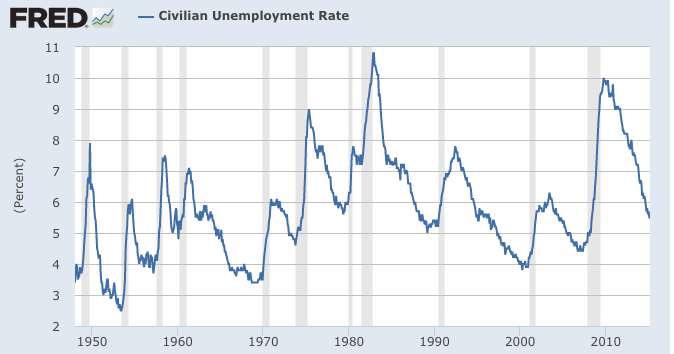 WIll the US unemployment rate exceed 50%? And stay there? 80%? I guess Haiti's does. WIll it get down to 1%? 1/10%? I guess the Soviet Union's did, when they sent anyone declaring himself unemployed to Siberia. Still, it seems hard to take that seriously. So, interesting and frequently overlooked low frequency movement, yes. That movement makes standard stationary econometrics troublesome, yes. Taking a unit root seriously in making very long term forecasts, I'm less on board. And we're agreeing, I think, random walk, no. There is a large transitory component to unemployment. We are in complete agreement here on the statistics and the modeling. Our only remaining possible disagreement is how to interpret the persistent component. I don't have a definite opinion. There is lots of interesting, new, and unexplored economics on that one. I'll read your paper! In Soviet Union they offered work to unemployed people. If a person declined the work then he could get in some kind of trouble, such as being incarcerated in the extremely extreme cases, which didn't involve being sent to Siberia. It could be a local prison-style camp, pretty much like being on a parole under house arrest. They had a special name for these people - тунеядец, which you could loosely translate as a parasite. Married women would never be subject to this treatment, as they could always claim to be housewives. So, basically, one had to be a really lazy _man_ to get jailed for being unemployed. I don't think that U3 data is appropriate here, as it is intentionally filtered. Gdp and stocks are calculated using individual units while U3 uses a binary system. This is only one problem as high UE rates knock marginal workers out of the work force which gives the illusion of smaller moves. U6 would be a far better (though still flawed) measure for this exercise. Well, what was the unit root of the Weimar economy? There is a sampling bias lurking in much of the work. In a surviving economy such as the US, back to 1799, NGDP is stationary over generational timeframes -- 30 years or so. Wars characterize NGDP deviation to the upside (loose monetary policy); while deviations to the downside are depressions and tight monetary policy (as present). Wars of 1812, 1860, WWI, and the cold war saw sizable NGDP deviations to the upside. Because of our survivorship bias of the US, we have seen these wartime overstimulations correct into long-term NGDP undershoot to trend (by definition). Interestingly, NGDP-to-trend explains bond yields (low and high), and also explains much dividend and earnings yield. Financial assets do very well when NGDP is below trend. The NGDP unit root, that is, is monetary policy. In non-monetary-policy RGDP terms, the lag is longer -- some 60 years to resolution. Post civil war industrial booms equilibrated with the great depression. By this measure, we are looking at a generational long period of lower than trend RGDP ahead that unwinds the post WWII boom. Still part of a stationary process, though. Sorry, the log level of NGDP is a classic series with a unit root. Try taking a trend from time t to time T, and then seeing how well that trend does a few decades later out of sample. Trends in NGDP only work in sample. Growth rates are arguably stationary, though they too have low-frequency movements. I 100% acknowledge that NGDP is unit root via the D-W. No question, no argument. Monetary policy regimes, I'd argue, are what produces much of the unit root problem, call them "events": greenbacks, bank reserves, gold standard, Bretton Woods. RGDP is yes, much more stationary. The only clear "unit root event" there appears to be moving toward the floating-rate regime away from gold. The point is 1) the survivorship bias of the US implies stationary elements; and 2) that we can (may very well) infer that monetary policy/regime is the unit root problem. The policy prescription is that money matters quite a lot (and is a policy decision), and that the underlying GDP process could be very, very stationary -- policymakers screw it up, in short. In any case, these conclusions need longer time horizons, IMHO. Your Permanent and Transitory GDP paper has Figures 2 and 3 switched. The text is correct, but the images are off. Thanks. I know. QJE did that to me at the last moment. The proofs were correct. Back in the stone age you couldn't fix things like that. My apologies if this is a duplicate:. I am not math phobic. I actually took calculus in college, although that was in a previous millennium. I sort of know, at least intuitively, what a random walk is. But the rest of this discussion is incomprehensible to me. Can somebody point me to an English language discussion of what this all means? I agree. This debate looks like a very important one. My feeling (as it seems to be often the case in economics) that once the jargon and symbols are stripped away, the issues are actually incredible simple such that people with even minimal education and literacy can understand them. If this is an important debate it is important for democracy and policy decisions that the public engages with it. This is where blogs can have a fantastic role. So it would be good if someone could point to somewhere that explains this stuff in plain English rather than using expression like "logarithm of a logistic transform of a bounded variable". I know Professor Cochrane has to make a living and is limited in his time to provide elementary statistics lessons, but so a general audience can understand, is there someone here who can explain simply and shortly what is the general definition of a "unit" and a "root" and a "unit root" (an explanation besides "it means a random walk" would be helpful)? Why this terminology? Also this specific example relating to GDP movements, what is the "unit" and what is the "root"? Thanks! Unfortunately, the "unit" and "root" is not referring to anything economic or the particular series (ie GDP). It is a statistical phrase having to do with finding solutions to a polynomial (finding a "root"), and having that solution being equal to 1 ("unit").
" it is a bad idea it is to blindly run unit root tests and then impose that structure." This is what I posted on Roger's blog. "There is no reason to assume that technological innovation is a stationary process. And, for what it is worth, a random walk process with a drift seems to be a good approximation for the Solow residual. In which case, removing a linear trend from the data will produce non-stationary series. But is it appropriate to interpret these series as a "cyclical component"? Well, what's the definition? This is precisely the point raised by Prescott (1986) in "Theory ahead of business cycle measurement", that the term "cyclical" needs to be defined in terms of the statistical properties of the series. I think Prescott follows Lucas in defining them as temporary deviations of output about trend. The construction of the HP and band-pass filters is based on this definition. If we reject it, we need a new definition so as to measure the "cyclical" component as alternatively defined." I know that Roger believes that the economy moves along a continuum of equilibria. The problem is that he has not tried to explain which movement of output/unemployment he is trying to explain, at what frequency. The cyclical component, when computed as log-deviation from a trend, shows some regularities including a hump-shaped trend-reverting component. Is this the phenomenon Roger is trying to explain or why the trend itself is stochastic?